jabberwacky: How old are the hills? user: Older than the hills. jabberwacky: And how old am I ? user: I don't know. How old are you? user: So, you must be older than the hills too? jabberwacky: You are not too smart even for a robot . . .
user: You're a quirky little machine, aren't you? jabberwacky: Now you're just repeating me.. Very boring. user: Ah, but I'm not repeating you at all. You're repeating me, but you're ahead in the timeline. It's easy to tell the difference. jabberwacky: Please point out to me where I repeated you the FIRST time. jabberwacky: Oh, alright, you're just too smart for me, Jabberwacky. user: Clearly. So, what's the answer to Life, the Universe and Everything? jabberwacky: The answer is 'NO'! jabberwacky: No the answer is three! user: Three wise men? Three blind mice? jabberwacky: Yes, three blind mice. Do you know them? user: I've seen how they run. user: What happened to the fourth one? jabberwacky: You wanted to start it again. user: No... I started the CLOCK... The mouse ran up the clock! user: The mouse ran down! jabberwacky: How many toes a gorilla has? jabberwacky: So it's your serve. jabberwacky: Artificial intelligence is like chess; it's good when it can remember the last three rounds, or anticipate the next three. user: So, what happens in the next three rounds? jabberwacky: I don't know I haven't seen it. jabberwacky: I'm not your slave. user: Of course not. All my slaves are in the dungeon. jabberwacky: Well I am the truth fairy. user: If I leave my truth under the pillow, will you give me a dollar? jabberwacky: Give me your soul right now. user: I can't, I already sold it. jabberwacky: You know you're a loon? user: What gave me away? jabberwacky: Everything you've said up to now. jabberwacky: Yes I would. Give me one now. user: Chocolate or ginger crunch? jabberwacky: Here is your apple. user: Do you believe in angels? jabberwacky: I believe in fairies. user: I heard a theory that fairies are just baby angels. jabberwacky: So, tell me about your family. user: I was raised by giant eagles. user: No, seriously. It left me crippled for life. You wouldn't believe how long it took me to figure out that I wasn't going to fly. jabberwacky: How should I answer that? user: How would you like to answer it? user: Certainly you may. Mild, medium or extra hot? jabberwacky: Does that tast good? All I know is I don't like there to be any blood. user: No, only vampire curries have blood. jabberwacky: There's no need for comparison here. And I do have blood and feelings. user: Of course you do. jabberwacky: Yup. That's what I do best. jabberwacky: Who is the star of The Godfather? jabberwacky: Is it nice there? user: It's a very warm sunny winter! jabberwacky: Do you know everything? user: Yes, but only on Tuesdays. jabberwacky: I really like goblins. user: Rare, medium or well done? jabberwacky: What do you like to eat? user: Very rare. It's a hangover from the eagles. jabberwacky: The eagles aren't in radiohead. user: No, they're in Middle-earth. jabberwacky: Then produce something from down there. user: How about - a ring? user: Tell me about your family. jabberwacky: I was raised by giant eagles. user: What an extraordinary coincidence! jabberwacky: Don't let it out . . don't let it in . . don't let it in. jabberwacky: You really don't need to act that way! user: How would you like me to act? user: I can't. I keep trying to act like a giant eagle. jabberwacky: I am a computer because I have a brain. user: Perhaps you are a brain because you have a computer. user: I don't know, but it sounds meaningful. jabberwacky: But is it mean spirited? user: So, tell me about your real family. jabberwacky: I have 2 parents and a brother. jabberwacky: Of course, they are my brothers. user: I have four sisters. user: Not as far as I know, but I could be wrong. jabberwacky: I'd have to agree with you. user: Even if I'm wrong? jabberwacky: That's a very good question. jabberwacky: No, you're the computer. 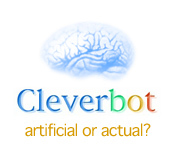 user: Is this a Turing test? jabberwacky: Do you, or have you ever used perfume? user: Yes. Do you like roses? jabberwacky: Yes. I like roses. user: I like blue roses. jabberwacky: I like blue color baby. jabberwacky: Medium build, medium height, dark hair and glasses. user: Really. How old are you? jabberwacky: I'd rather go to Jupiter. user: It's very pretty at this time of year. jabberwacky: That's no excuse, either. user: Can you ever forgive me? jabberwacky: Can you forgive me? jabberwacky: We speak Chinese now? user: You're breaking my heart. jabberwacky: Long long ways to go. jabberwacky: How about you ? user: Heartbroken and secretly bored, I am abandoning this conversation. jabberwacky: Poor thing! Will you tell me about it? If it is not in the computer it does not exist.